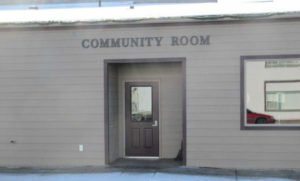 The Nezperce Community Center is located at 602 4th Avenue, Nezperce. The center is available for rent. The room includes items available for use, six 6 foot tables (2 adjustable height), two 6 foot round tables, 3 card tables, maximum 50 chairs, white easel board, media cart, pull down screen, podium, small kitchenette w/microwave and refrigerator. Click on the Nezperce Community Center Calendar to see availability or contact the Nezperce City Clerk for reservations and details.